The solar industry is heading off into the sunrise. A growing number of U.S. solar service companies that had their birth on the West Coast are are expanding East, among them SolarCity, which will roll out its solar electric system installation service in New York, Massachusetts, New Jersey and Pennsylvania next month. The California-based company is expanding its reach through acquisitions: SolarCity announced Thursday it's buying the residential solar business of Vermont-based groSolar, which will keep its commercial installation and solar panel distribution business. That deal comes hard on the heels of SolarCity's announcement of its first East Coast foray, its January deal to buy Clean Currents Solar, which serves Maryland and Washington, D.C. The companies declined to disclose the purchase price for either deal. "East Coast is an exciting market because there are a lot of people in concentrated locations," says Lyndon Rive, CEO of SolarCity. "There are many states with local incentives to help people adopt solar." The latest acquisition cements SolarCity's position as the largest residential solar installer in the country, Rive says. There's no hard data available to rank solar installers and their market shares, but SolarCity says it booked the most projects last year in California, based on a state-run database that tracks proposed and completed installations that qualified for incentives. The company has set up solar electric systems for schools and companies such as Walmart, which hired SolarCity last fall to install solar panels at a few dozen of its stores in California and Arizona. California is the largest solar market in the country, and it gives rebates based on the size of each solar electric system or payments based on actual power production. Newly acquired groSolar has the largest service area on the East Coast, Rive notes. SolarCity, which has about 1,000 employees, has installed for or signed up about 12,000 residential and commercial customers since its inception in 2006. With the purchase of groSolar's residential business, SolarCity will expand its operation to 21 locations in 10 states. SolarCity has raised funds from banks to finance $700 million's worth of residential and business installations, says company spokesman Jonathan Bass. The company has raised money from the likes of Citigroup (C) and U.S. Bancorp (USB). The company's moves reflect a broader movement by solar service providers to expand their business eastward. California-based Sungevity raised $15 million in venture capital late last year to prep for a move to Northeastern states such as New Jersey this year. The company currently serves California, Arizona and Colorado. Last month, Solar Universe, also based in California, said it had raised $7 million in venture capital in order to increase its presence on the East Coast and finance a push into the Canadian province of Ontario, which offers lucrative solar incentives. Solar Universe, which runs a franchise program, already has a few franchisees in New Jersey and Pennsylvania. It's no coincidence that these companies -- and many more like them -- first set up shop in states that offered incentives to install solar early on. Solar electric systems may save money over time, but they are expensive up front, which makes states that offer a combination of rebates or tax breaks for installing solar panels -- and impose mandates on their utilities to increase their use of renewable electricity -- prime markets for solar entrepreneurs. In California, the average price for a residential system is about $34,800 (before incentives), according to the state's solar incentive tracker. Last week, Con Edison (ED) said its customers in New York City and Westchester County, N.Y., more than doubled their amount of solar power generation in 2010. New York wants to get 30% of its electricity from renewable sources by 2015. Many types of renewable energy would qualify in meeting that target, including solar, wind, hydropower and fuel cells. The growing demand for solar power from consumers and businesses has spawned different business models. 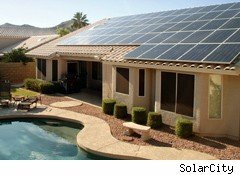 SolarCity provides sales, installation, financing and operating and maintenance of solar electric systems with staff in-house. Over 80% of its residential customers have used leases to finance their systems since the company launched its own lease program in 2008, Bass says. Business customers tend to sign power-purchase agreements in which they pay for the amount of electricity used. With leases or power-purchase agreements, customers can start using solar electricity with minimal upfront costs. Other installers, such as groSolar and Real Good Solar, direct customers looking for financing to San Francisco-based SunRun, which not only provides leases and power-purchase agreements but also offers monitoring services. Sungevity, on the other hand, offers sales and financing services, but hires contractors to do the installations. Solar Universe is creating a franchise of installers, and it refers consumers to certain banks and even solar panel manufacturer Suntech Power for financing. "In order to make the residential market work, you really need to have a trusted brand and scale. I'm convinced that the best way to success is to control customers' experience," Rive says. "If you don't do all the services yourself, you'll be missing big pieces."